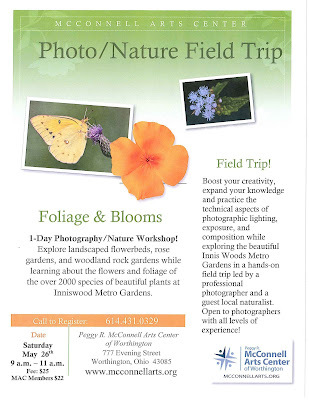 There's still time to join us at Inniswood Metrogardens this Saturday (May 26) for a nature workshop. Would you like to learn how to use your camera to take awesome nature images? Myself and pro photographer Barb Schwartz will help you capture what you see. Sign up for this two-hour class today by calling the Peggy R. McConnell Arts Center of Worthington.